This level have normal difficulty that require good strategy to complete this level. 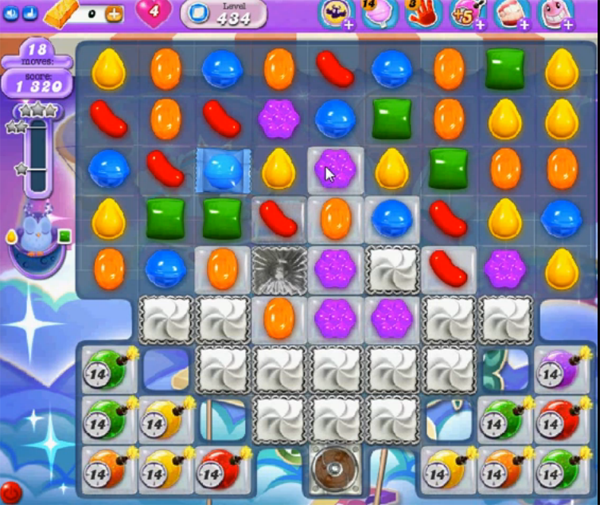 For this level try to break the blockers and make colorbomb with striped candy combo with balancing the Odus owl. After try to make more colorbomb if you can and match with normal candy or use them or other special candy in moonstruck that you will get after 15, 9 and 3 moves remaining so you can balance the Odus owl and reach the requirement. It’s only 10 moves now. One moon struck. How come the hints has 18 moves instead of the 10 I get when I attempt to do this level? I have found this a couple of times. Sick of this. I tell friends watch out. They only gives you enough moves to clear all but one or two to clear level so you need to spend money. Ready to delete this rip off game. Not any fun anymore. Impossible.good bye. Too many rip off levels of kate. Sad but true. Dreamworld is a total ripoff! Tutorials always show more moves or more chocolate ball (I.e. Level 430), than what you actually get. Not doing dreamworld any more. King doesn’t play fair and some levels are IMPOSSIBLE, no fun!! !